Phillies payroll indicates owners are finally "committed to winning"
Now that the Phillies have blown up their payroll by adding Cliff Lee, the total payroll looks to be over $160 million in 2011. Once regarded as greedy Gremlins who lurked in dark alleys, all of a sudden this Phillies ownership group is "committed to winning." But just how committed are they? I thought it might be fun to watch the progression of the Phillies payroll in recent years. The chart below shows the progression of the total payroll since 2001. Once referred to by Bill Giles as a "small market" in 1994, the Phillies payroll lived up to Bill's claim as recently as 2001 with a payroll of just $41.66 million. Ten years later the Phillies total payroll has skyrocketed to around $160 million. Have the Phillies owners finally decided that winning is more important than making the most profit? The answer is no. As the charts below will indicate, the Phillies owners are no more or less committed in 2011 than they were in 2001. You see, as much as Phillies fans don't want to admit it, the owners weren't paying because the fans weren't going. Bill Giles was right when he called Philadelphia a small market because at the time fans were not attending games. The next chart shows that the payroll went up at nearly the identical rate of the attendance. As fans, we want to have an owner like a George Steinbrenner who is willing to pay whatever it takes to put a winner on the field. It sure would have been nice if the Phillies ownership group decided to forgo a little profit during some of the bad years to help build a team that fans wanted to see. But the next chart shows that the Phillies ran the team no differently than any other club. They ran it like a business and their spending mirrored the attendance. It would have been nice if winning was the most important factor, but the Phils owners ran the team like a business. The moral of the story is this: the Phillies ownership group was not lining their pockets any more or less than the other owners. I am like many fans who crucified the owners when they weren't spending the way I hoped they would spend. For better or for worse, the Phillies owners let the books decide how much they would spend and they closely followed the bottom line. But there might be a wrinkle to this tale. The Phillies maxed out the attendance last season, yet they increased the payroll close to $20 million this year. Are the rumors true that John Middleton took his profits from the $2.9 billion sale of his cigar company and decided to break the bank to get Cliff Lee? Or are they just running business as usual? Before we turn our attention completely towards the next season, I thought it might be fun to break down the Phillies' wins and losses in 2010. Perhaps we can gain a little access into the mind set of the team and what we can expect next season. For this particular exercise we will examine just wins and losses. I don't care how they got there; it's just the end result that matters this time. And we will be looking at very basic stats for the most part. The below chart shows the Phillies record against each division, home/road, righty/lefty, in extra innings, 1-run games, and day/night. Most of the Phillies records didn't reveal a whole heck of a lot. You can see clearly that the Phils did most of their damage against the NL East. They played 16 games over .500 against the NL East and just 6 games above .500 against the whole rest of the league. If Charlie Manuel decided to plot out exactly how the Phils would get their 97 wins, I bet it would look similar to this. Dominate your division opponents and play OK against the other guys - sounds like a good strategy, doesn't it? Again, the Phillies followed a good winning formula: Play .500 or better on the road and play great at home. The Phillies road record of 43-35 may not blow your mind, but that was tied for the second best record in the NL and tied for third best in all of baseball. Unlike 2009, they played very well at home. We all know that Phillies had a lot of left-handed hitters in their lineup and other teams LOVED to load up on their southpaw relievers. The Phils certainly fared better against right-handed starters, but not drastically better. They had a very good winning percentage of .605 against righties and a respectable .583 record against lefties. A clear sign of a good baseball team is when they play well in pressure situations. The Phils handled the pressure just fine. Their extra inning record tied for the third best winning percentage in the majors. Their winning percentage in one-run games (.630) was by far the best in all of baseball and the second best percentage was 56 points less than the Phils. The Phillies clearly LOVE to play in prime time. They finished just 4 games over .500 during day games and 28 games over .500 under the lights. That is a bit interesting since last year they were better during day games (12 over .500) than they were at night (9 over .500). The most interesting record to me was what the Phillies did after a win and after a loss. The Phils demonstrated in 2010 why it is so important to have a "stopper" on the mound. 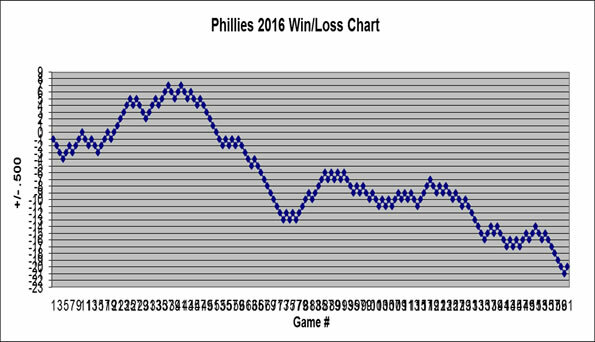 The Phils had a terrific .629 winning percentage after wins and just barely above .500 after a loss. That proves just how important momentum can be. The stats are always going to look good when you win 97 games in a season. What impresses me the most is how consistent they were. They were good on the road and at home, against the NL East and against the other divisions, in day games and in night games, versus righties and versus lefties. Teams that play consistently generally have a better chance in the postseason than streaky teams. And finally, their record in extra innings and in one-run games shows that the Phillies did not scare easily. It's report card time! As we do every year, Phils Baseball will once again review and grade the entire 2010 Phillies roster. We will begin with the unsung hero and nucleus of the team: Carlos Ruiz. 2010 was a coming out party for Carlos Ruiz. Chooch had by far his best year at the plate, setting career highs in hits, on-base percentage, slugging percentage, OPS, and batting average. He also led the team in batting average and on-base percentage. Much of Ruiz' success can be attributed to greater patience at the plate. His 55 walks were 8 more than his previous career high. Prior to last season, Ruiz averaged a walk every 8.8 plate appearances, but in 2010 he walked every 7.9 appearances. Chooch also grounded into fewer double plays. I always used to say Ruiz competed with Pedro Feliz for the most groundouts, but last season he matched his career low in double plays with 8, but did so with 54 more at-bats. Ruiz was equally as effective behind the plate. He is terrific at blocking balls in the dirt, protecting the plate, and decent at throwing out base runners. He finished 2 points above his career caught stealing percentage at 29%. He once again handled the staff extremely well, catching a perfect game and a no-hitter from Roy Halladay. You can view all of Carlos Ruiz's career stats here. Below are Ruiz's stats over last two seasons. We continue on with our Phillies report cards. Now we will grade the Phillies big slugger: Ryan Howard. Ryan Howard has put up some incredible numbers in his career, and the Phillies rewarded his efforts with a 5 year, $125 million dollar contract. Ironically, this was the first year that Howard didn't put up heroic numbers. In fact, 2010 ended Howard's streak of four straight seasons of 40-plus homers and 135-plus RBIs. For his standards, 2010 was a down year for Howard. A .276 average with 31 home runs and 108 is nothing to sneeze at, but it is not what we have come to expect from him. A stint on the disabled list is a big reason why his power numbers were down, but even if he played all 162 games he would have only ended up with 35 home runs and 122 RBIs. But the numbers show that the injury did more than just cost Howard games. For most of the season his batting average was up and his power went down. After July and before the injury, Howard had a .292 average with 23 home runs and 91 RBIs. That would have put him on pace for 36 homers and 143 RBIs, which would have been 11 less HR than his 162 game average, but 13 points above his normal batting average and actually 5 RBIs ABOVE his normal RBI totals. Howard just wasn't the same for the first couple weeks after the injury, batting just .125 with 1 home run and 4 RBIs in 10 games in August. Even if Howard's production was nearly the same, the fact remains that Howard's Slugging percentage (.505) and OPS (.859) were all career lows. You can view all of Ryan Howard's career stats here. Ryan Howard had a good year by most measures and essentially equaled his previous production totals, but did it with less long balls. 36 home runs may not blow you away, but 108 RBIs in 143 games aint bad for an "off year." Chase Utley had another disappointing season. Fans loved to make excuses for Utley in the past. For whatever reason, fans said he looked tired for playing so hard or looked injured, but they always seemed to give Utley a free pass. The honeymoon might be over for Utley soon, because his numbers have continually declined over the last several seasons. His average (.275), homers (16), RBIs (65), Slugging Percentage (.445), and OPS (.832) have declined in each of the last four seasons. His numbers were still good for a second baseman, but they aren't the numbers of an MVP type player that fans thought he could be and that the Phillies are paying him to be. His .275 batting average isn't too far off his career average of .293, so that part of his game doesn't appear to be dropping much. But his power has practically vanished. Had he played the entire season, Utley was on pace for 23 homers and 92 RBIs. Utley went from averaging a home run every 20.5 at-bats in 2006 to once every 26.5 at-bats in 2010. Chase Utley had a decent season by most measures, but his lack of production changed him from an emerging superstar to just another good ball player. It is very possible that Utley was playing hurt once again and once he is healthy we will see the old Chase Utley, but who knows if that Utley still exists? You can view all of Chase Utley's career stats here. Now it is time for the leader, team quarterback, team captain, etc. for the Phillies: Jimmy Rollins. Jimmy Rollins had another very forgettable season in 2010. After going through a horrible slump in 2009, I didn't think it was possible Rollins could get worse, but he did. J-Roll missed half the season due to injury, but he wasn't much of a factor when he did play. He finished with a dreadfully low .243 average and .320 on-base percentage. His 48 runs scored prorates to about 88 runs scored in a full season, which is way to low for a leadoff hitter in this lineup. One thing that hasn't changed one single bit is his defense. J-Roll still mans the shortstop position as well as anyone in the game. No matter what he does at the plate, Rollins never, I mean NEVER lets it affect his defense. I hate to give Jimmy such a low grade, but his numbers are just not very good. It is hard to be much of a sparkplug when you are not effective on the field. You can view all of Jimmy Rollins's career stats here. Moving right along with our 2010 report cards, we come to one of the few new members to the Phillies: Placido Polanco. Bringing Polanco to Philadelphia might be Ruben Amaro's most overlooked and underrated moves. Amaro signed Polanco as a number two hitter who can make contact, hit for average, get some "first to thirds," and provide some consistency to the lineup. That is exactly what Polanco did. Placido finished first in the team with 165 hits and finished with a .298 batting average. Like most other Phillies players, Polanco was dealing with an elbow injury all season. Even after coming off the DL, Polanco just was not the same. After hitting around .300 all year, Polanco batted just .261 in Sep/Oct, bruising a fantastic season. Polanco was strictly a high average contact hitter since he only walked 32 times and only hit 6 home runs. But that is fine for a number two hitter and it is exactly what we expected from him. The only thing keeping Polanco from an A+ is his lack of walks, home runs, and runs scored. Otherwise, what a great season for him and what an upgrade over Pedro Feliz! You can view all of Placido Polanco's career stats here. Now we give our report card to a fan favorite in left field: Raul Ibanez. After a perplexing first season with the Phillies in which he was on fire for the first half and injured and awful in the second half, nobody knew what to expect from Raul Ibanez. What we discovered is that the real Ibanez was somewhere in the middle. Raul's average and on-base percentage were nearly identical to the previous year at a respectable .275 and .349, respectively. But the big difference was in his power. Despite having 61 more at-bats, Ibanez had 18 less home runs and 10 less RBIs. Age seemed to catch up to Rauuul, as the 38-year-old watched his slugging drop from .552 to .444 and his OPS dive from .899 to .793. Overall, Raul Ibanez had a very average season. He wasn't bad, but he was nowhere near the guy from the first half of 2009. If the rest of the team hit the way they were supposed to, Ibanez would have been a very nice number 6 hitter. You can view all of Raul Ibanez's career stats here.